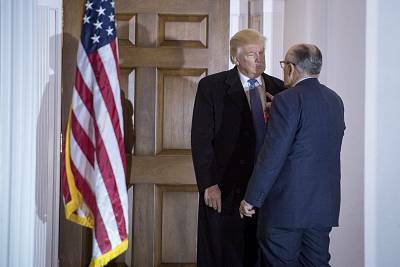 Do remarks by Giuliani, Trump count as witness tampering or obstruction? 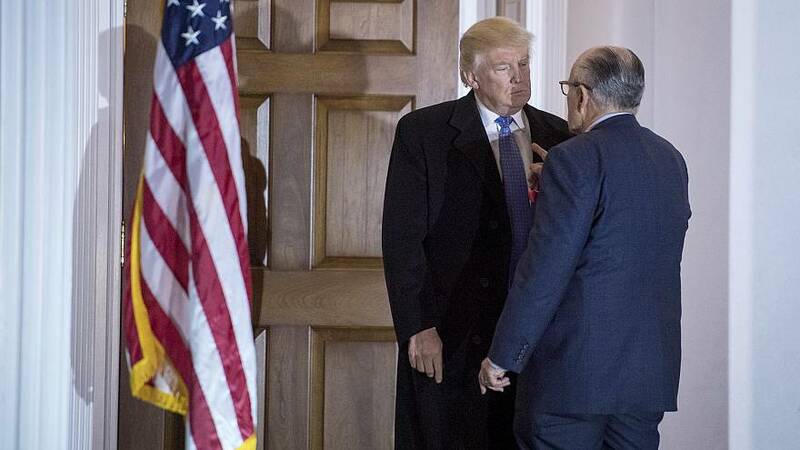 Do Rudy Giuliani's and Donald Trump's recent comments about Michael Cohen constitute obstruction of justice or witness tampering? Trump tweeted last Friday: "Don't forget, Michael Cohen has already been convicted of perjury and fraud, and as recently as this week, the Wall Street Journal has suggested that he may have stolen tens of thousands of dollars. Lying to reduce his jail time!" Trump added the cryptic recommendation to "Watch [Cohen's] father-in-law!" Last week Giuliani, in his capacity as the president's attorney, said on CNN's State of the Union that Cohen's "father-in-law has millions and millions," adding "I'm telling you, he comes from the Ukraine. This reason that is important is, he may have ties to something called organized crime." Giuliani also suggested Cohen was lying about Trump for a favorable sentence. There are several federal statutes that cover obstruction of justice when testifying before Congress. Indeed, Michael Cohen has already pleaded guilty to one crime: unsworn false statements made directly to Congress. But several other statutes cover non-witnesses influencing a witness's testimony before the legislative branch. Some of these statutes may apply to Giuliani and Trump's statements. One federal law criminalizes influencing, obstructing, or impeding any inquiry or investigation by any House, or any congressional committee "corruptly … or by … threatening … communication." Another law criminalizes obstructing congressional activities by intimidation or threat, or by intentionally harassing a person to dissuade him from testifying in an official proceeding. Those are just a few of the potential crimes committed when a person attempts to influence a witness testifying before Congress. It's hard to suggest that it's illegal for Trump to call Michael Cohen a liar in a tweet. it's factually true. Cohen pleaded guilty to lying. The government would probably concede the truth of Trump's comment that Cohen is cooperating for a favorable sentence. That would not be a crime. Tweeting out a news story while referring to a cooperating witness, as Trump did with the Wall Street Journal, could possibly be witness intimidation, but not likely under these facts. Consider, for example, if Trump instead tweeted out an unrelated news story about a cooperating witness being killed, or meeting some violent fate, and then a reference to Cohen. That could amount to witness intimidation. In fact, even reference to a fictional story could tamper with witnesses. A hypothetical example drawing from Friday's indictment of Roger Stone demonstrates that context is everything in the world of obstruction and witness tampering: Imagine Trump tweeted that Cohen should do a "Frank Pentangeli," (as Stone allegedly recommended to a witness). Frank Pentangeli is a fictional character from the film "The Godfather: Part II," who ultimately kills himself instead of cooperating with the government. In that situation, even a reference to a fictional story in a tweet about a cooperating witness could constitute witness intimidation, by suggesting that a witness commit suicide rather than testify for the government. Perhaps more than the words themselves, context is everything. The most problematic part of Trump's tweet is the cryptic recommendation to watch Cohen's father-in-law. Did Trump mean that he believes Cohen's father-in-law is just generally a bad actor? Or, do those words mean: Watch what happens to Cohen's father-in-law after the president has him persecuted for Cohen's cooperation? The latter interpretation is much more nefarious, and much closer to an actionable threat. Once again, context, and the intent ascribed to the words, is critical. Giuliani's comments suggesting that Cohen and his family are connected to organized crime may be intimidating to Cohen and his family, but are likely not criminal — yet. Criminal defense attorneys routinely stand up in court and call cooperating witnesses liars, or emphasize a cooperator's shady ties. When a defense attorney like Giuliani raises these issues on cross-examination, the experience can be very intimidating for a witness. Yet, this kind of character attack from the defense is not only accepted, it's expected. Even cross-examination about Cohen's putative family connection to European organized crime would be acceptable, if the defense has a good faith basis for the inquiry. Outside of court, an attorney is more vulnerable to legal consequences for his statements, but in the case of cooperators, prosecutors appear to accept the general practice of defense attorneys calling their cooperators liars, even to the media. After all, Cohen, like many cooperators, is a convicted liar. Ultimately, it's difficult to compare Trump and his attorney's statements to other cases of obstruction and witness tampering, because the words come from the most powerful person in the country. If context is everything, then arguably all statements from the commander in chief are uniquely intimidating, and unlike those of any other citizen.